Access your purchase history and payment details anytime, anywhere. Link a new credit or debit card. Withdraw your funds. All within a single account. It’s your money. So you should choose how you want to spend it – by credit or debit card, or PayPal balance. Activate your account by confirming your email address. Add your credit and debit cards to your PayPal account and choose which one to use each time you pay. Find great bargains at your favorite international stores, and millions worldwide. It’s easy to transfer money from your PayPal account to your linked bank account. We’re not just talking about brownie points. Use your credit or debit card through PayPal and continue earning your reward points. Everything you need is right there in your account. Customize your profile just the way you want it – notifications, credit cards, mobile quick checkout and more. 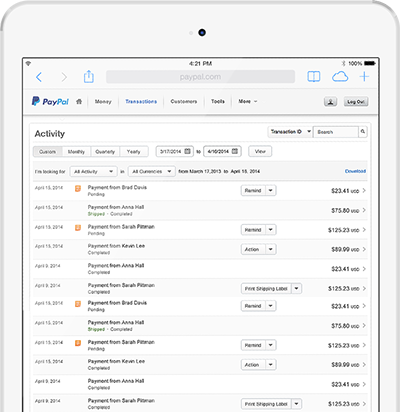 Make use of PayPal app to send and receive payments, check your balance and transactions, where you go.